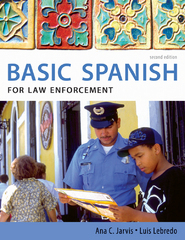 ramaponews students can sell Basic Spanish for Law Enforcement (ISBN# 0495902535) written by Francisco Mena-Ayllon, Ana Jarvis, Ana (Ana C. Jarvis) Jarvis, Ana Jarvis, Luis Lebredo, Raquel Lebredo, Francisco Mena-AyllÃ³n, Ana C. Jarvis and receive a $6.72 check, along with a free pre-paid shipping label. Once you have sent in Basic Spanish for Law Enforcement (ISBN# 0495902535), your Ramapo College textbook will be processed and your $6.72 check will be sent out to you within a matter days. You can also sell other ramaponews textbooks, published by Cengage and written by Francisco Mena-Ayllon, Ana Jarvis, Ana (Ana C. Jarvis) Jarvis, Ana Jarvis, Luis Lebredo, Raquel Lebredo, Francisco Mena-AyllÃ³n, Ana C. Jarvis and receive checks.